Craftin' Dawn: DDC# 16 "How do you LAYER up?" Good Monday morning! I hope that you all had a wonderful weekend! my hubby and step dad. 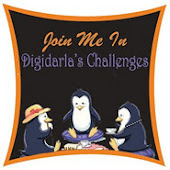 This week at Digi Darla's we are sponsored by Di's Digi Downloads! They are offering up a $10 voucher to their store! see those layers! So get out your scraps and get to layering!! I started with light purple card stock and did a gate fold card, then on the "gates" I cut dark purple card stock, and then on top of that I used some design paper...So that is my first few "LAYERS". Then with my image I chose a new release Digi Darla Birthday Cake 202, love those "LAYERS" too! I colored it up with prismacolor pencils, then chalked the edges with pink shimmer chalk. 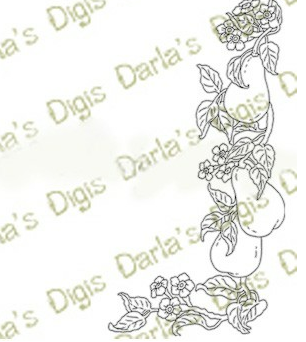 Then I mounted the image on lilac glitter card stock, and then put that on a floral peice of cloth that I stitched at the bottom and then put that all on one more "LAYER" of design paper from my stash! 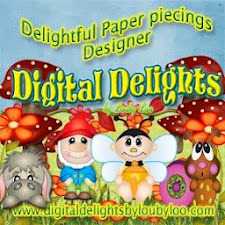 So with the Layered Cake Digi, and all the layers of the cardstock, I think I have got a "LAYER" thing going on!!! What do you think?? Lets see how YOU "LAYER" up!!! 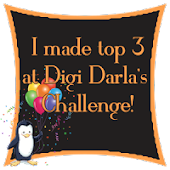 Pop on over to Digi Darla's Challenge blog and join us this week! We Love seeing what you create! Our play and win Freebie this week is "Pear Boarder"
we will email you the freebie!! That simple! Cant wait to see what you all have for us this week!! This is a great Gatefold card Dawn! 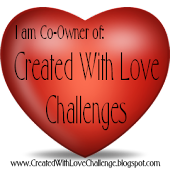 And I think you mastered the "Layered" challenge! :-) Fun colors you chose!! Now that's a lot of layers! Great card. That's such a wonderful image for layering! Just love what you did. How fitting for the challenge a LAYERED CAKE! Awesome! This is gorgeous, Dawn! Love all the layers you used and too cute that it's a cake! Beautiful card.love the fold of the card and cake.Hope your hubby enjoy the bbq.